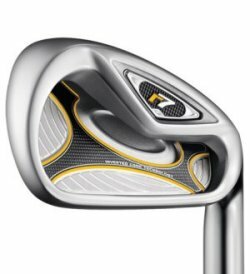 The new TaylorMade r7 Draw irons are the latest distance innovation from TaylorMade. Engineered with the same Inverted Cone Technology that has made their drivers #1 on Tour, these irons feature Draw Weighted Technology to remove weight from the cavity area at the toe and position the CG back and closer to the heel. An expanded COR zone provides increased yardage, especially on mis-hits. This revolutionary design makes the new r7 Draw irons more forgiving and more workable than ever before. From Anonymous of New York, New York on 8/10/2007 . These irons are so easy to hit! 8/10/2007 – Do these come in left hand?